& Other Stories – boxy fit cashmere turtleneck. On colder days it’s nice to have something like this to throw over your head. Boxy fit cahsmere turtleneck. 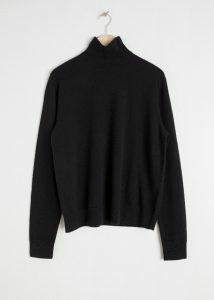 Length of turtleneck: 64cm / 25.2″ (size S). Model wears: S. Cashmere 100%. Product No. 0687293001. 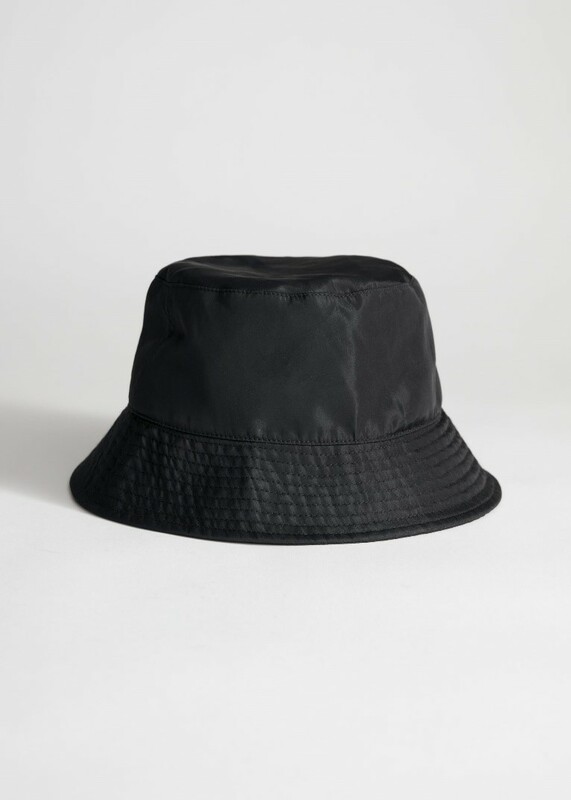 & Other Stories – black bucket hat. I see black bucket hats everywhere this season. On the runways and in the shops. Structured bucket hat with a sloping brim. Lined. Shell: Polyester 100%. Product No. 0725760001. 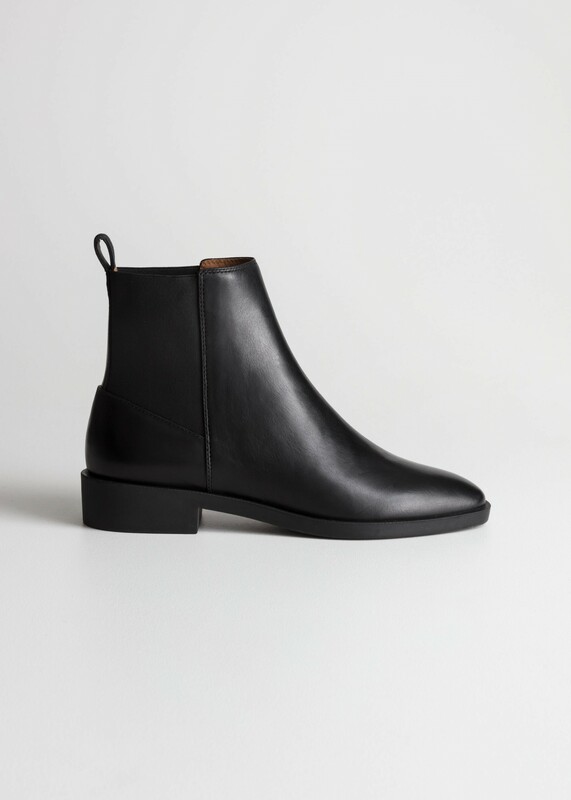 & Other Stories – black leather Chelsea boots. 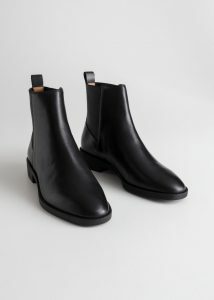 Chelsea boots are a classic and I will always have a pair or two in my wardrobe. They are perfect for early spring. Go back to basics with these utlimate classics and oh-so-loveable chelsea boots. Stacked heel. Rubber outsole. Leather insole. Heel heigth: 3 cm / 1.2. 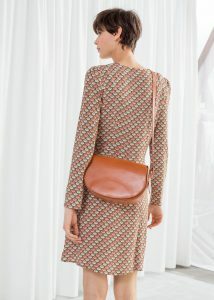 Lining: Calf Leather 100%. Upper Part: Calf Leather 100%. Sole: Rubber 100%. Product No. 0399317001. 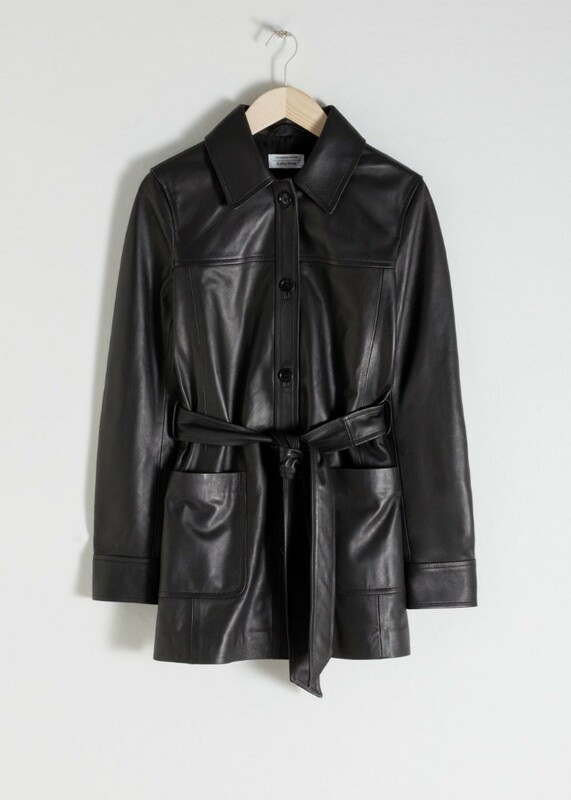 & Other Stories – black belted leather trench jacket. 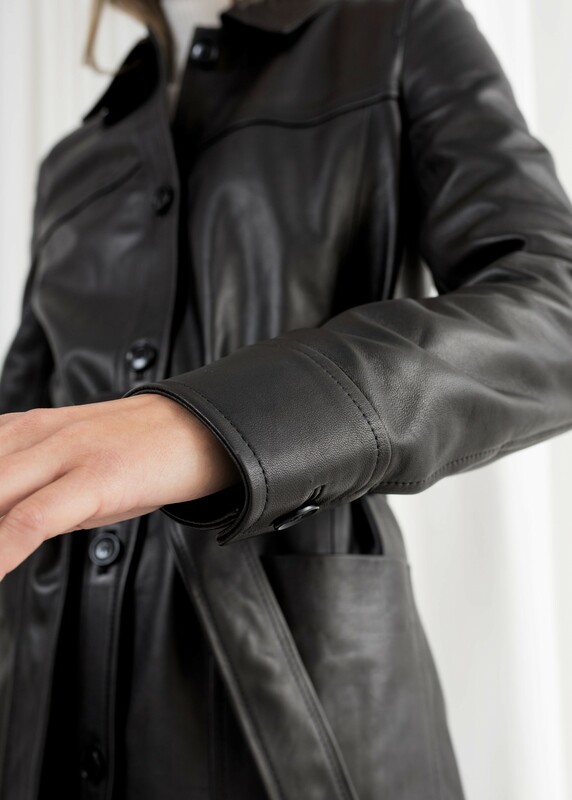 A cool jacket in leather will give an edge to your outfit. Smooth leather trench jacket with large patch pockets, a leather waistbelt and front button closures. Lined. Relaxed fit. Pointed collar. Button cuffs. Length of trench: 73.5 cm / 28.9″ (size 36). Model wears: EU 36/ UK 10/ US 4 / small. Shell: Lamb Leather 100%. Lining: Viscose 100%. Product No. 0703764001. 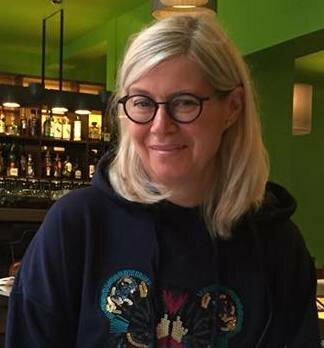 & Other Stories – mini dress with fan print. So delicate colours. A cute and feminine dress. 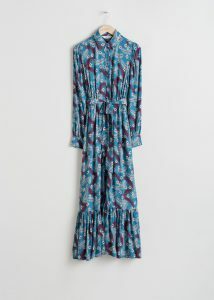 Art deco inspired fan print flared skater dress with long sleeves, an overlap button closure placket and a defined waist. Fit and flare shape. Invisible side zipper. No stretch. Length of dress: 91.5cm / 36″ (size 36). Model wears: EU 36/ UK 10/ US 4 / Small. Model height: 178cm / 5’9”. Shell: Viscose 100%. Product No. 0694382001. 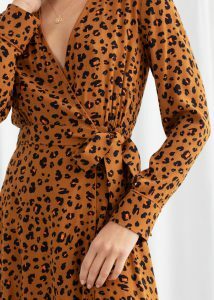 & Other Stories – Belted midi dress with leopard print. So cool and elegant. A very special dress. 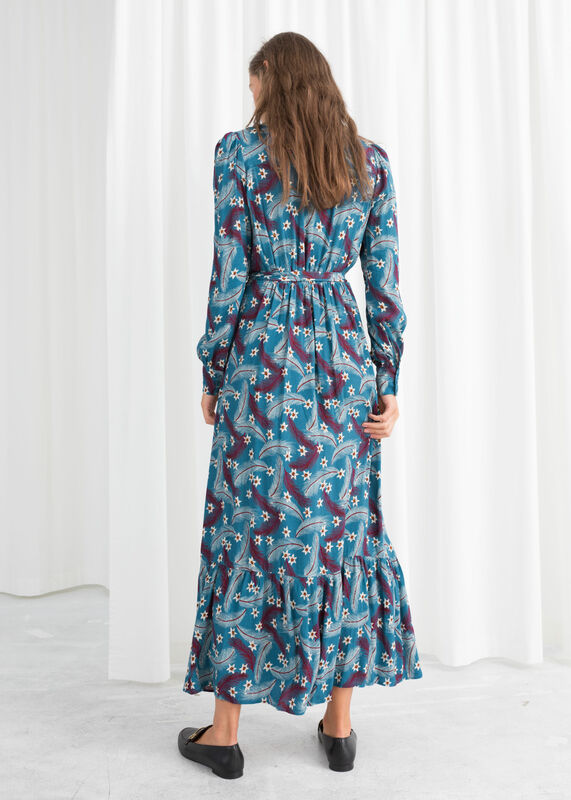 Long sleeve midi length dress in an allover leopard print, with a square buckle waistbelt, slanted front pockets and front button closures. No stretch. Defined waist. A-line skirt. Length of dress: 119.7cm / 47.2″ (size 36). Model wears: EU 36/ UK 10/ US 4 / Small. Model height: 178 cm / 5’9”. Shell: Viscose 100%. Product No. 0694384001. & Other Stories – long sleeve button slit midi dress. I love this cool floral print. It is so different. Long sleeve midi dress with an a-line skirt, detailed with a button up side slit. Pleated skirt. Gather shoulders. Button cuffs. Invisible back zipper. Length of dress: 122.5cm / 48.2″ (size 36). Model wears: EU 36/ UK 10/ US 4 / Small. Shell: Viscose 100%. Product No. : 0713163003. 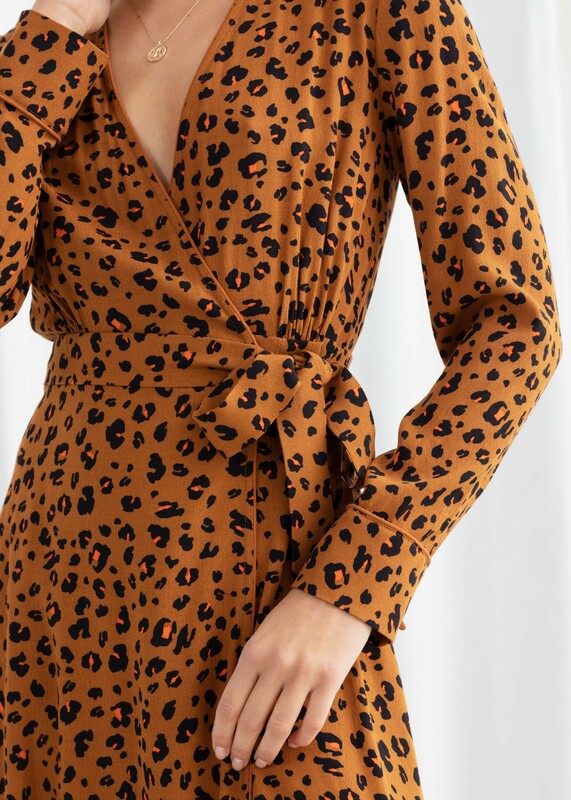 & Other Stories – leopard print wrap dress. 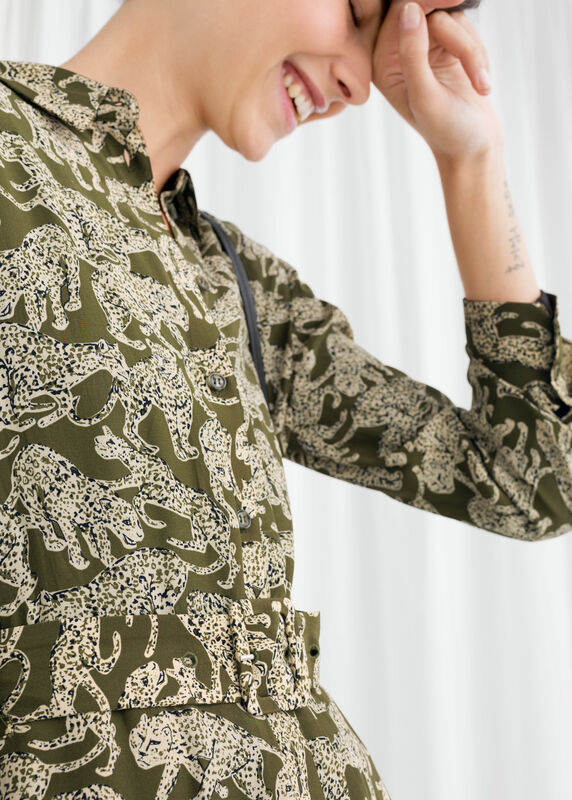 Leopard print is always a winner. Here in a new interesting colour combination. 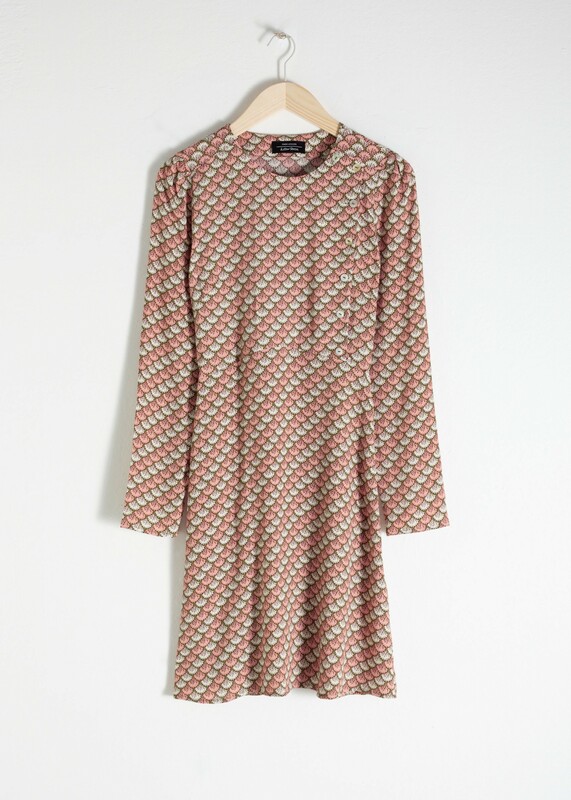 Midi length wrap dress with a side tie, long sleeves and waistline ruching. Invisible button closure. Button cuffs. 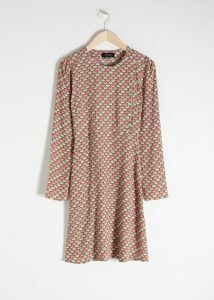 Length of dress: 116 cm / 46.7″ (size 36). Model wears: EU 36/ UK 10/ US 4 / Small. Shell: Viscose 100%. Interlining: Polyester 100%. Product No. 0728177004. 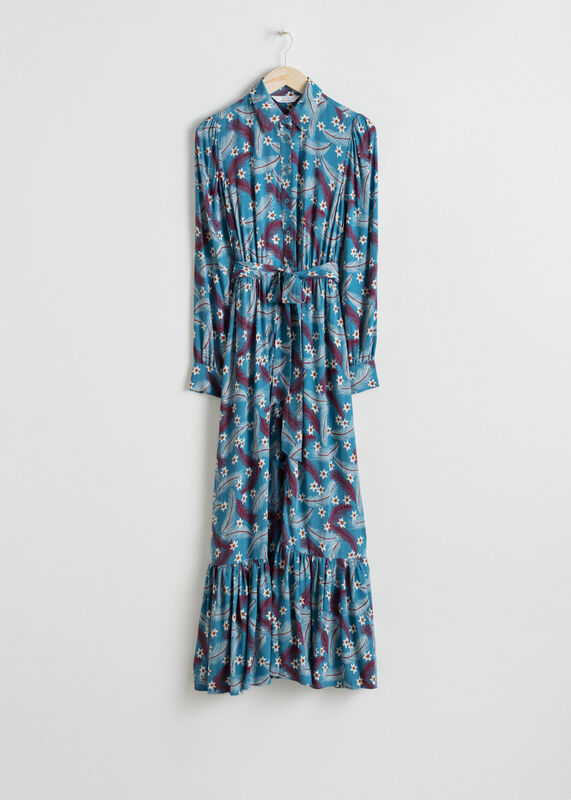 & Other Stories – blue belted ruffle midi dress. 348 dkk (was 695) here. Long sleeve midi dress with front buttons and a removable waistbelt. Detailed with a ruffled hemline and buttoned cuffs. Shimmery plaid print. Length of dress: 133.7cm / 52.6″ (size 36). Model wears: EU 36/ UK 10/ US 4 / Small. Shell: Viscose 100%. Product No. 0654929002. 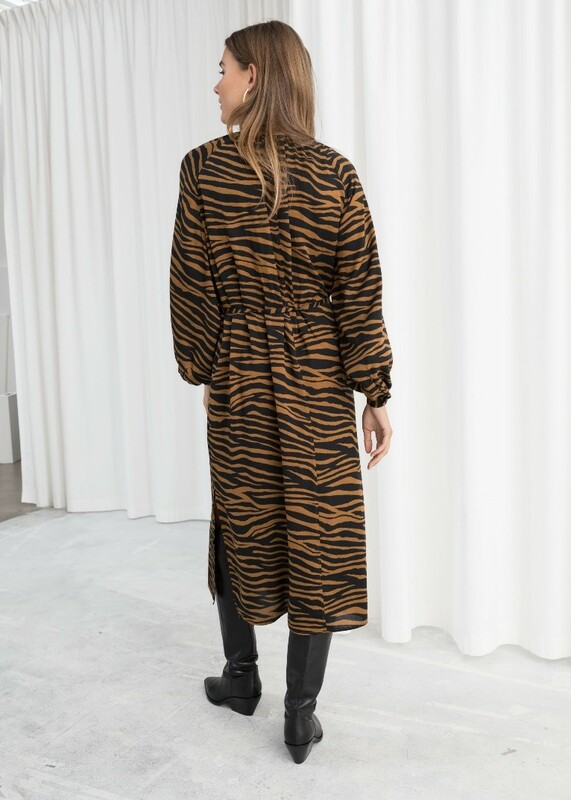 & Other Stories – oversized belted zebra midi dress. A very cool dress. I love the big sleeves. Oversized zebra print midi dress with cuffed balloon sleeves, front button closures and a waist tie. Mandarin collar. No stretch. Length of dress: 118.2cm / 46.5″ (size 36). Model wears: EU 36/ UK 10/ US 4 / Small. Model height: 176cm / 5’9”. This dress is oversized, if you would like a more fitted look, please size down. Shell: Tencel Lyocell 100%. Product No. 0693645001.